Is the Chicco Viaro Stroller Travel System a good choice for your family? Find out in our detailed review. The Chicco Viaro Stroller Travel System combines Chicco’s Italian fashion roots with a slim, sporty design that’s popular with many parents. The combo comes with the top-rated Chicco KeyFit 30 infant car seat. It has many features that busy families will appreciate. This moderately priced system is a little cheaper than the Chicco Bravo travel system and should last a long while. Both car seat and stroller have generous weight limits, so even when your baby outgrows the seat, you can still use the stroller well into toddlerhood. Here, we’ve compiled all the details, stats, pros and cons along with real customer experiences so you can decide if the Chicco Viaro is right for your family. Why invest in a travel system? When you think about all the items you purchase for your baby, it’s quite an extensive list. Any products that can multi-task can save you time, money and frustration. For on-the-go families, a travel system can take some of the hassle out of shopping, and it eliminates the chance that your car seat might not be compatible with the stroller. While babies can’t ride in the stroller alone until they sit up, a travel system gives you all the mobility benefits of a stroller, since the car seat fits right on it. With just a few clicks, you can unfold the stroller, pop out the car seat, pop it onto the stroller, and off you go for a nice day at the zoo or mall or a nice, long vacation. Plus, you minimize the chance of waking up the baby during each transfer. There are a lot of nice features to this travel system that make it popular with parents and caregivers. Chicco is a well-known brand with products that often with top honors for safety, ease of use and reliability. This particular system was designed for the urban family in mind, slimmer and lighter than its cousin, the Chicco Bravo. It comes in 3 color choices: cranberry, teak (gray), and coastal (blue/gray). What are the child size limits for the Chicco Viaro travel system? Parents felt the car seat (KeyFit 30) worked really well for their newborns and preemies – not too big or small. It’s also highly recommended by NICU nurses. There weren’t any complaints about the fit that we could find. Note: The comparable Chicco Bravo travel system has identical weight ranges, but is 4-wheeled and with the car seat, weighs about 23 pounds as opposed to the Viaro at 18 pounds. The Bravo also runs at least $30 more than the Viaro. 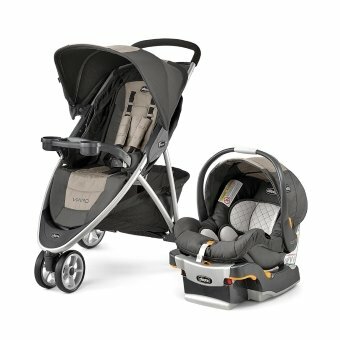 How big is the Chicco Viaro travel system and will it fit in my vehicle? Portability may be the biggest downside to this travel system. Several parents felt the stroller was too bulky when folded up to go in their trunk. This seemed to be due to the snack tray protruding more than anything. Some did note, however, that this stroller maneuvered better than compact-folding ones, so it’s a tradeoff between storage and maneuverability. Some parents, however, thought the rear wheels were too wide apart and got stuck in narrow aisles while shopping. Others felt the cup holders were way too narrow and only fit skinny water bottles instead of sippies or travel mugs. As far as the car seat itself, it won’t take up much space in the backseat with the 17-inch width. Though, for compact cars, it could be a bit bulky, especially if you need to fit in more than one car seat. Harness slots without newborn insert: 8, 10, and 12 inches. How safe is the Chicco Viaro travel system? When installed properly, the included KeyFit 30 infant car seat has an excellent safety record. It ranked in the top 5 for crash testing against comparable brands. For head injury protection, it actually tested higher than federal safety standards. This seat has nice thick EPS (energy absorbing) foam and lots of head and body support to protect even the smallest infants. The infant insert pillow provides an extra layer of protection for preemies and newborns. A spring-loaded ReclineSure leveling system including bubble levels on each side of the base help ensure the proper fit and recline angle. The SuperCinch LATCH tightener provides a secure, tight fit in just a pull. Some reviewers have had trouble getting the shoulder straps tight enough. Also, one parent reported that just hearing one click may not mean the car seat is securely in the base. This user had to press down harder until a louder click was heard. So be aware that you can’t depend on a click alone. We recommend you always pull up on the seat to make sure it’s nice and snug in the base before driving. Other reviewers have found the fabric on the seat interior doesn’t breathe well enough, contributing to excess sweating. They’ve also found the canopy didn’t cover well, leaving the baby somewhat exposed to the sun. Be sure not to dress your child too warmly when riding and use car window shades and/or thin blankets to keep the sun off and avoid overheating. They have reported that the Keyfit 30 Magic has an improved canopy so it may not be an issue with that model. The stroller itself has some nice safety features including the toe-tap breaks for parking. That’s great news for busy parents who need to make quick stops. 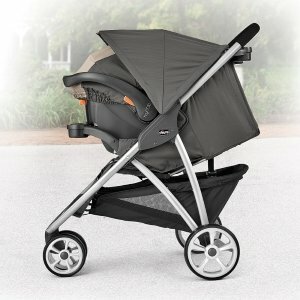 Along with the seat canopy, the stroller canopy can completely cover the baby with no gaps to protect from the elements. Good front suspension plus the three wheel design help parents maneuver quickly and safely through winding paths, crowds and traffic. The biggest issue parents reported with this stroller is that it doesn’t lock in place when folded. When removing it from a vehicle, it can flop around and pinch your skin if you’re not careful. The back tires can be too wide for some narrow passages. The tires don’t roll smoothly on rough terrain. Some parents didn’t like that the shoulder and lap straps were all separate, so they weren’t sure if their babies were strapped in well enough. We think this could be problematic for busy parents, especially if one parent is out alone with more than one child. The handle has no height adjustment, so it might be uncomfortable for some taller parents. Also, some parents noted the lack of a peek-a-boo window in the canopy so they could easily look in on their babies without disturbing them. How easy is the Chicco KeyFit 30 to install? With the car seat base, parents generally agree that the car seat is super easy to install, thanks to the ReclineSure system, the SuperCinch latch and bubble levels. Without the base, however, several parents had a hard time getting the correct angle and tightness. There’s a red line on the label that helps you guide the seat belt for the correct angle. But some parents had to use rolled up towels to level it out. Note: Be sure to fully recline the stroller seat before attaching the infant seat to it. Works for both the original and 30 model. Make sure you have at least two bases if you’re going to be transferring the car seat from one vehicle to another. It’ll save time and you won’t have to worry about correct installation of the base every time. Take this little travel changing station, and you’ll keep baby clean and dry everywhere you go. It holds up to 4 diapers with wipes and can clip on your wrist or your stroller. A zippered pocket holds your keys, wallet, phone, etc. Keep an eye on your rear-facing baby with this handy mirror. It goes right on your headrest with straps that keep it snug and secure. You can glance at your preemie or older baby and know if they’re in urgent need of care. Fabric on car seat may not be breathable enough; watch for overheating and excessive sweating, especially in hotter months. For the car seat alone, we think the Chicco Viaro travel system is a great choice for most families. It’s not as expensive as its competitors, lightweight, works well together and each piece is compatible with other Chicco seats and strollers. Car seat installation with the base is simple enough for first time parents. It’s also a great seat for preemies and very small babies. The stroller has a good one-hand fold feature. Toe-tap brakes are handy for a quick, secure stop. A swivel front wheel and slim design provide good maneuverability on smooth terrain. It’s a good looking system with 3 nice colors to choose from. For the urban family who isn’t going to hike on rough terrain, it’s a good option. Keep in mind that if you do a lot of shopping in malls where store aisles tend to be narrow, you might not be able to fit the stroller through well. We really didn’t like that the stroller doesn’t lock when folded up. While the bulkiness complaint is easy enough to remedy with a removable snack tray, the lack of a lock to keep it from flopping and pinching a parent’s arm when getting in and out of the car is disappointing. 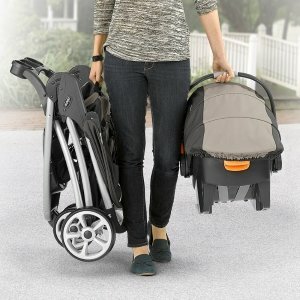 All in all, however, the Chicco Viaro travel system would be a good investment for a busy family or first time parents. If you can find one in a retail store or if a friend has one, take it for a test drive just to be sure the operation, height, etc. will work for you.